Environment Commissioner Julie Gelfand in Ottawa on Oct. 2, 2018. Canada has committed to slash carbon emissions 30 per cent below 2005 levels by 2030, but the most recent federal projections show emissions will be only 19 per cent lower by then under the most optimistic scenarios. The censure comes one day after a major federal study warned that Canada’s climate is warming at twice the global rate and nearly three times the global average in the Far North. The Liberals face mounting opposition on a range of environmental policy fronts ahead of a fall election in which climate change is expected to be a defining issue. Federal scientists said Monday that average temperatures across Canada have increased 1.7 degrees and by 2.3 C in the North since records became available in 1948, and that further warming is unavoidable. Ms. Gelfand on Tuesday released the last of her audits before her five-year term expires, including an assessment of invasive aquatic species, mining pollution and fossil-fuel subsidies. She criticized the federal Liberals for failing to live up to a commitment to end “inefficient” fossil-fuel subsidies, which she said encourage wasteful consumption, impede investments in clean energy and undermine efforts to combat global warming. Canada and other Group of 20 countries have pledged to phase out inefficient fossil-fuel subsidies by 2025, and eliminating them was a key campaign promise for the Liberals in 2015. 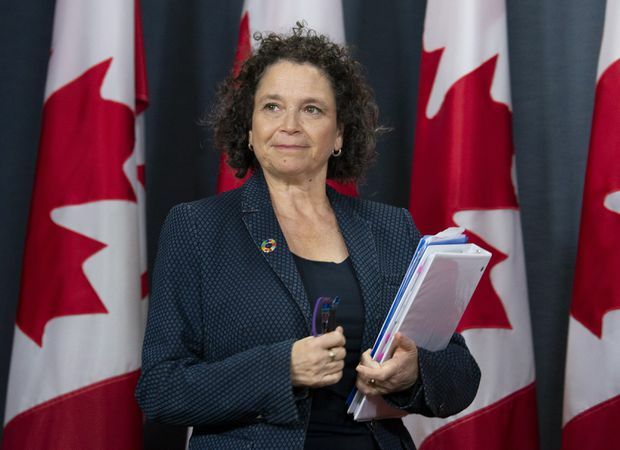 Ms. Gelfand said there is a direct link between the commitments and efforts to combat climate change, but found neither Finance Canada nor Environment and Climate Change Canada (ECCC) adequately define what constitutes an “inefficient” subsidy. Her office found Finance Canada focused almost exclusively on fiscal and economic considerations and didn’t weigh social and environmental factors, for example. Meanwhile, ECCC looked at only 23 out of more than 200 federal organizations when it compiled an inventory of potential subsidies for the fossil-fuel industry. The International Institute for Sustainable Development has estimated oil and gas producers receive about $3.3-billion in subsidies, including roughly $1.6-billion from the federal government. Examples include reduced property taxes and special tax deductions. Environment and Climate Change Minister Catherine McKenna on Tuesday said Ottawa is committed to the 2025 goal and defended wider efforts to slow climate change. The government has so far cancelled eight of nine tax preferences that support fossil-fuel exploration or production and last week launched consultations to inform the phaseout of subsidies outside the tax system. The department says it identified four of 36 subsidies that benefit fossil fuels but found that none of them were inefficient. They included electricity supports for off-grid Indigenous communities, charging stations for electric vehicles, as well as funding for clean technologies in the oil and gas industry. The Liberals face staunch opposition from some provincial premiers as well as from federal Conservative Leader Andrew Scheer over the federal carbon tax that took effect Monday in New Brunswick, Ontario, Manitoba and Saskatchewan. A spokesman for Mr. Scheer did not respond by press time. In Alberta, United Conservative Party Leader Jason Kenney has pledged to scrap the province’s carbon levy and fight the federal backstop in court should he win the April 16 election. Alberta is also seeking an equivalency agreement on federal regulations to reduce methane emissions by 40 to 45 per cent by 2025, arguing current standards would further hamper the oil and gas industry. Environmental groups have criticized Alberta’s proposed rules and similarly decried a draft agreement with British Columbia, saying the provincial standards would substantially weaken efforts to curb emissions of the potent greenhouse gas. In 2018, the federal government announced that all provinces would need to implement a carbon-pricing system by April 1, 2019 and those that didn't would fall under a federal carbon tax. But what is carbon pricing anyway?